This Directory is divided into three main sections: Towns, Alphabetical, and Trades and Professions. These enable the enquirer to see at a glance, firstly, the names of householders or traders in any one town; secondly, the address and occupation of any resident in the state; and thirdly, the number of persons in the state engaged in any one trade or calling. 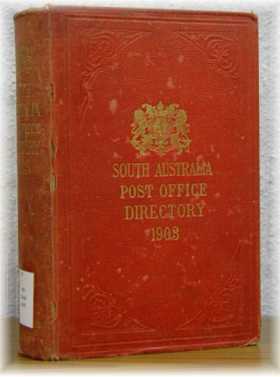 The towns section contains separate Street Directories of Adelaide, North Adelaide, Port Adelaide, and Suburban and Alphabetical Directories for every other Town, Township and Postal District in South Australia. It also includes Broken Hill and Silverton in New South Wales. The alphabetical section contains the names for the entire state. The directory includes many pages of advertisements - all useful information, often including names of people and places. It's an invaluable genealogy tool for anyone searching their family history or building a family tree.